As of June 2014 Honda Motor Company has sold 1.35 million gasoline, electric hybrid automobiles worldwide. We take a look at Honda’s best selling North America hybrid offering. 2015 Honda Accord Hybrid’s futuristic driving experience. I’d been trying to get my hands on the wheel of Honda’s 2015 Accord Hybrid for months. They’re hard to come by; Honda PR hasn't offered to lend us one and we haven't asked. With 10,000 units sold in North America through Sept 2014, Accord Hybrid is as rare as hen’s teeth. Dealers tell us that they could sell as many Accord Hybrids as they could place in stock, Honda Japan is stingy with batteries and hybrid systems. Last Friday that all changed for me. With a search of Western Oregon dealership inventory; I found one. Calling on my friend Paul Casey of Kendall Honda, Acura of Eugene, the only 2015 Honda Accord Hybrid available in Western Oregon fell into my P-AWS. While our test Honda was a bare bones entry level Accord Hybrid variant, Torque News happily took it out for an extensive drive and review; we weren't disappointed. Without getting teary eyed or giddy while spewing expletives, exclamation mark punctuated prose as to the attributes of Honda’s finest Accord offering to date, I’ll just say it. This is the Honda that I would purchase as my daily personal driver without reservations or extended periods of buyer’s remorse. Honda offerings? I’ve driven them all including Acura’s class setting 2015 TLX. While Accord Hybrid is not the TLX, it offers some things that TLX doesn't; a futuristic seamless EV only drive, electric motor torque and the coolest electronic blue and green lit glass dash in the automotive universe; sitting in Accord Hybrid is a trip in itself. It’s difficult to describe in words the sensation of transporting oneself in a nearly 2 ton personal transportation conveyance while experiencing elevator-like silence. I discovered iMMD technology, Accord 40 mph EV- only city driving and fell in love with it; something I never expected this old V8 loving motor head to do. The Starship Enterprise electric warp drive sound unique to Accord Hybrid is a fair trade-off for Honda’s iconic V6 growl; you won't miss the exhaust note. I found myself circling a major retail mall parking lot with the driver side window rolled down searching for a discernible gasoline engine noise, there wasn't any. Much like a kid experiencing his first hour with a new remote controlled EV, I was fascinated by the eerily silent whirl of Honda’s EV- only hybrid drive. Much like driving the world’s largest enclosed golf cart with the comfort of grandpa’s last century Cadillac or Lincoln, Accord Hybrid is rock solid, comfortable and quiet. It takes a moment or two to get used to the feel of Accord Hybrid’s regenerative brakes. I found them to be a bit grabby at first, but settled in after a mile or two. They’re electric mechanical regenerating disks with a slightly different resistance and bounce than power assisted hydraulic brakes. After a very short initial adjustment period, you forget the difference. ABS? yes, it’s there. Don’t let the low horsepower and torque rating of Honda’s 2 liter four(140 hp) mislead you, it doesn't tell the story of the most advanced trouble-free(and only) series parallel hybrid available to North America. The truth is, horsepower and torque ratings may no longer directly equate to power transference as manifested through Honda’s latest E-CVT( electronic continuous velocity transmission) In this case, the electric motor in Accord generates greater torque than the primary gasoline generator. (that’s correct) It’s a brave new world. While power ratings are still measured at the drive wheel, the greatest difference between Honda and Toyota hybrid drive systems may be how the power gets there. The current generation Honda Accord Hybrid is the only gasoline/electric hybrid on the road today that keeps the engine disengaged from the drive wheels when traveling below highway cruising speeds. When launching from a stop sign and increasing road speeds to 40 mph, Accord Hybrid remains in EV- only mode and can do so for up to 14 miles under normal driving conditions. In EV mode the 2 liter “ EarthDreams” i-VTEC 4 is utilized as a generator. Regenerative brakes, auto engine stop and Honda’s 2 liter EarthDreams ™ engine provides battery regeneration and highway running primary power while consuming 10% less fuel than the competition’s comparably sized engine. The non-shift pattern and exceptionally fluid drive of the E-CVT takes a bit of getting used to. At lower speeds the driving experience is bordering on mystical, but when you put your foot to the metal, all hell breaks lose; sound wise anyway. Think of the direct drive in your buddy's inboard ski boat. When Accord Hybrid transitions from EV mode to electric, gas engine when accelerating, there’s a noticeable commotion under the hood, but it doesn't happen often nor unnecessarily. I found the Accord Hybrid to be relatively quick when pulling onto the highway and reached 70 mph by the end of the on ramp. What’s a bit disconcerting is that there’s very little recognizable torque sensation getting there. Hybrid Acceleration is par to the V6. The ride comfort, handling and interior noise level is superior to any other car in Honda’s lineup. Other than the dash layout you won’t find anything out of character in Accord Hybrid. Our test mule although be it basic trim, was comfortable, roomy, intuitive and pleasant to the eye. Accord is the best selling midsize 4 door sedan in North America because it offers the most car for the money, period! Generally, I’m a leather interior guy, I found the base model Accord Hybrid’s 10 way adjustable cloth upholstered driver’s seat to be uncharacteristically comfortable. 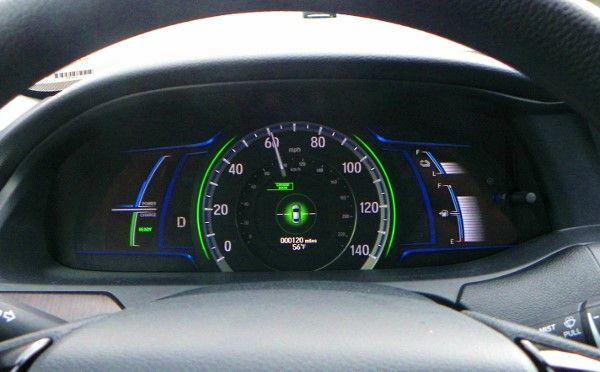 Even this basic Accord came with backup cam, right lane watch, Bluetooth connectivity, voice command and a very decent 8 speaker stereo system with Honda Sat-link capabilities. I like the active electronic noise cancellation and stability control standard on Accord Hybrid. You may read the standard features list here; a lot of car for $30 K.
Gone is the day of the cheap plastic clad interior. Honda’s done a commendable job of upgrading all interior hard and soft surfaces, increasing leg and headroom in the back seating area while improving rear ventilation and heating. Visually Accord Hybrid is pleasing to the eye, proportionally correct, aerodynamic and stylish without being brash or ostentatious. I appreciate Honda’s upgraded headlights, parking lights, tail light trunk-line interface and updated 17” alloy rims; a great looking modern 4 door sedan. This 6’5” car nut was comfortable sitting on the rear bench. Passenger visibility and comfort is top in class. O.K. let’s wrap it up Parks! To me the highest fuel economy in it’s class is simply the icing on the cake that is 2015 Honda Accord Hybrid. 47 EPA mpg combined in a car approaching the full size category is mind boggling. But, based priced at the $ exit portal of a fully equipped Accord Tour, with fuel pricing in North America falling below $3 for the first time in 4 years, I look to the extraordinary driving experience afforded through Accord Hybrid’s E-CVT and “Series Parallel Hybrid” drive technology to seal the deal. For me, the guy that can and does drive any car he wants to, the 2015 Accord Hybrid is the Honda that I would purchase as my personal driver: it’s that good. Perhaps a thicker bolstered carpeting with pull down picnic trays in the rear lounge. Drop down 3D monitors with a hotel suite-like minibar and 20” dubs. Now that I've caught your attention, Well-- nothing, really! I owned a 2013 V6 Accord that I absolutely DESPISED and got rid of in only 9 months...why? Because the ride was soooo stiff, firm, over-damped and uncomfortable that I couldn't stand it anymore. NO mid-size sedan should ride like that. If I had wanted a car that rode like a Corvette, I would've bought one. It's a shame that you tossed an otherwise well built reliable car. As a Volvo S 80 driver, I agree with you. The standard Accord ride is stiff. That's what tire shops, aftermarket shocks, struts and spring settings are for. The Hybrid's ride is much improved over your variant. I hope your current ride meets with your satisfaction.What did you purchase after the crushing of the Accord? I was an early purchaser of the 2014 Accord Hybrid one year ago (Nov 2013) and now have over 20,000 miles on the car. I am a converted Hemi V-8 guy, so I am right with the author of this article. The savings in fuel cost and consumption are fabulous, but the general ride, drive feel and noise levels are equally great. One caveat: our Accord Hybrid is the Touring model (only one available at a dealer in our area then), and the fancy Forward Collision Warning and Lane Departure systems depend on a radar sensor in a low-to-the-ground dam under the front bumper that gets pounded from low curbs, parking blocks, road debris, etc. Very expensive to repair/replace. Go for a lower trim model without this expensive headache! Good to read you Texas22Step. Thanks for the tip.is your Accord Hybrid mechanically trouble-free, how is the EV-only mode effected by cold winter-weather? Take care. Thank you. I am looking to purchase one and you are the only one I am able to find with miles on it. Whenever I hear anything about battery breakthroughs I think of this Accord hybrid. Imagine if battery prices came down by 50% and also became more dense by 50% (same size, twice the range, half the cost). It would be cars like this that would immediately dominate the market, not full EVs. Honda, GM, Ford and Toyota combined have dozens of cars like this that could easily be converted to primarily EVs, but with basically unlimited range. The future cars are already here. They are hiding in plain sight. I agree John. These are exciting times in automotive engineering development. With fuel efficiency increasing in today's micro-sized I.C. engines, I anticipate almost unlimited torque and fuel economy advances in the near future. Thanks for dropping in. can you tell me if driving mostly highway if this hybrid would work for me. I am a dedicated Honda fan! Welcome Lilbit. Yes, I believe you will find highway driving in Accord Hybrid to be a pleasant experience. While fuel economy is highest in city driving due to auto-engine stop and regenerative braking, our readers report 45+ mpg on the highway.Test drive one when you find the opportunity. The Accord Hybrid has a relatively small & lightweight 1.3 kwh battery. It cannot go 14 miles in EV mode only; it's more like a mile or two a two at most before it flips the engine back on. The Plug-In Hybrid version of the Accord has a 6.7 kwh battery, which is significantly heavier and more expensive. That model, which is otherwise almost identical to the Touring version of the standard hybrid, does have a 13-14 mile EV-only range. Welcome HAH. Thanks for your input here. Is this statement based on the indicated math or your personal driving ownership experience? Please clarify, always happy to read and learn. Personal ownership; we've had a 2014 Accord Hybrid for a few months now. EV mode is useful to go the last mile or two if you want to do it in almost silence. If you want to run many miles in EV mode alone without the engine popping on to replenish it, you need to get the plug-in version. Thank you HAH. Much appreciated. I have a accord hybrid EX-L, LOVE IT! The cold weather has shaved MPG,s off the fall mileage, which was 42-44 now is 38/39 but that is still great for such a large car. We drive this car 50/50 local and Highway miles. This car handles very well has great acceleration with a tiny bit of hesitation. The brake mode on the gear shift lever slows done the car too much so don't use it, the smaller trunk has been of no problem, it is still big enough for the groceries of a family of 4. Welcome Rick. Tell us a bit more about the brake mode, Hill assist, active stability mode? I was impressed by Accord Hybrid. Love the concept! My HAH brake mode just pulls down the speed to much, even on a 8% grade hill so I just use the brakes that do the same thing, when the battery display shows 100% the car will not brake at all with the electric motor, guess there is no place for the energy to go. I have no clue about the hill assist but the active stability works very well, you have to work hard to upset the cars handling. This is by far the nicest car I have ever owned but my wife always has it so I don't get to enjoy it much. I contacted two or three Honda dealership... One quoted me like $26800 and another one quoted me the same. Somehow, this Honda dealership offered me $25150. This dealership sells over 100+ Honda cars a month. I ordered my Accord Hybrid EX-L today. I found the salesmen said different things. When I drove the first one I ask about replacing the batteries. He said they would need to be replaced between 80 and 120000 miles and cost 1500 a piece. Today, the after sale guy said they cost 5000 a piece when trying to get me to buy the most expensive service packages. I've done some research and found they usually don't go bad early. I suspect it was a scare tactic. I also wonder if the regeneration is during braking only as my habit is taking my foot off the pedal and coasting before I brake when I see a stoplight. Today the guy said slowing would regenerate just as well as braking. Later, he said he had just gotten the job and didn't know much about hybrids. Thanks for your input. There is a warranty on the battery-pack and electric portion of the drivetrain. It varies based on state, but is either 8-yr/100k miles, or 10-yr/150k miles. If you are within that timeframe/mileage and your battery fails, it is fully covered under warranty for a replacement. Nobody knows what the replacement battery cost will be 8 years down the line. For the people replacing hybrid batteries right now (for vehicles several years old right now), there are more expensive OEM options, as well as after-market companies that are selling battery packs for much cheaper than Honda or Toyota want directly. Right now, the OEM cost of the battery pack is likely higher than that $1500 estimate, but it's impossible to say whether that is still accurate forecasting that many years in the future. The regen occurs under normal slowing, but it recovers more energy if you engage the brakes while slowing. There is a real-time display on the left side of the dash that shows how much /. how fast the car is recovering energy. While coasting in normal mode, it typically shows 2 bars of regen. While coast in B mode (which ramps up the regen), it typically shows 4 bars of regen, and doesn't coast as far. When braking even at moderate rates, it can max out the recovery to all bars (I think it's 10 or 12). The trick to maximizing range is to not use such hard braking that all of it can't be recovered, and needs to engage the friction brakes rather than the regen portion. You want as much deceleration as possible to be used to generate electrical energy instead. Good for you to order the new Accord Hybrid! At least here in Texas, the hybrid batteries enjoy an 8-year warranty, so I am not sure how worried you should be about eventual replacement cost. The regeneration can be enhanced in the Accord Hybrid by simply "shifting down" to "B" and letting the car slow you down while regenerating the batteries, with or without braking. Welcome Moxie. I've spoken with Honda Insight owners that have reported 8 years on their battery modules. I'd anticipate the same from Honda Accord, however, that's just an opinion. Yes.they are pricey. However, if you set aside your savings on fuel costs, I believe the Hybrid will $ pencil out for you. Ask your dealer for full disclosure on the actual cost of the replacement modules and, request a discount on the extended battery warranty in the negotiation of the purchase. In the case of " engine deceleration, and braking, yes, both actions send a charge back to the battery module. It's a great car. enjoy! in some states, the warranty for the battery is 10yrs/150k. The cost to replace one is about $2k + labor = 3K. The regeneration happens when your foot is off the gas pedal.. I have the car for 1.5 months now, hybrid in general is no good for very cold winter and snow.. I got like 12 MPG in city driving in a very very cold day (0 degree) and around 35 MPG in above 30+ degree. In 60-70 degree, I got 40+ easily. Welcome Tony. True enough!, extreme cold is tough on all automated systems. Thanks for the detailed information, Much appreciated.